You’re going to rely on your builder over a long period of time, so you want to be sure that the builder you select has the project management experience, integrity, skilled trade partners and experts, and a personalized customer service approach through the entire project. Guidance and education are critical to the getting true value in this process. Having built hundreds of new and custom homes in and around Sacramento over the past two decades, the ESI Builders Team has developed a proven, step by step, detailed process that ensures that the journey to your new home will be as smooth as possible. Our approach is simple: We do that by a providing our clients with turnkey and cost-effective support services including all elements of your new custom home project. From conceptual design to engineering, design reviews, and permitting through material selection, daily subcontractor management, and budget assurance. And our client’s tell us that they truly appreciate our clearly defined approach that’s supported by honest, frequent, and direct communication. Clear and effective communication is critical to developing and documenting an understanding of the scope, style, finishes and budget to make every Custom Home project successful. Physical lot evaluations and consultation with engineers and experts to assess potential building restrictions on every lot. We then proceed to partner with clients to understand their goals for the size, features, and key elements of each home. We do this through customized questionnaires, scoping and design review meetings, multiple designs and iterations with our architects and design partners or the design team you select. Hand in hand with you, ESI Builders will help make your vision of perfection a reality on paper, in your mind’s eye, and through the permitting and building process that follows. Once you are comfortable with the final custom home design, we will again reach out to proven subcontractors and tradesmen to finalize the project costs and set a workable schedule. With over 30 years working with key partners in Northern California, we have a number of outstanding craftsmen and subcontractors that work as an extension of our team and who meet or exceed our standards of excellence. As such, their interest is the same as ours — your satisfaction. Based on final costs and material selections, we’ll work through a simple, yet protective contracting process for the custom home project and start the ball rolling. Permit acquisition can be time consuming, costly, and complex. Our process strives to address the building department’s priorities and needs — the first time. After completing all the design and permitting requirements, under the orchestration of the ESI management team we will proceed quickly with site preparation including clearing and grading. Construction will proceed according to our detailed schedule with subcontractors and craftsman working together and in close sequence to minimize the amount of time needed to complete the quality project. Every day our ESI Project Foreman will be on-site working and overseeing the project and communicating with you ‐ all to ensure the project meets or exceeds the quality expectations and plan elements. 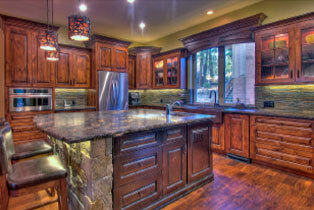 For ESI, completion of your custom home is more than just cleaning-up and walking out. Always seeking to improve our processes, we will also solicit your feedback and input on the project. And even then, ESI is still not done — we stand by our work and for the next 10 years, responding to any questions, concerns, or warranty items that come up. We are local and committed to your long term satisfaction.